the whole family for the entire holiday! Most other puzzle books only last a few minutes. Either they are too easy or the solver gets bored and looks up the answers. However I like puzzles to be worth doing, so although I give hints, there are no answers! To make the challenge worthwhile, each book has its own theme, and if you solve EVERY puzzle you can then find the big secret of each book. No general knowledge is required, instead you'll need a lot of logic and reasoning. If you enjoy puzzles and entertaining your brain, then did you know recent studies have shown that by playing number games like sudoku and even bingo can improve your IQ. Most new online casino sites can provide many games which will keep your mind active for hours. You can try it on this site bingosweets.com but make sure to pick one of the bingo bonuses from here. Players looking for country specific information such as Aussie's may like to visit a guides like this Australian casino portal for listings of reputable sites to play at. 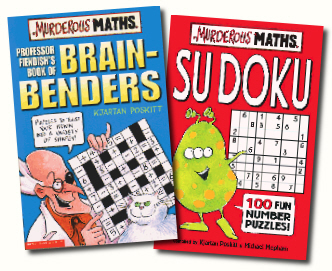 Hippo Scholastic have so far published four titles in the "Killer Puzzle" series and I have had many enquiries from both children and even more adults who have lost sleep over them! By way of apology more hints and some solutions to Killer Puzzles are given here. If you're still stuck, do feel free to contact me using the "Contact Kjartan" link below. OVERSEAS READERS: Some of these titles are now available in non-English editions including German and Dutch which I hope you can find your way through even if I can't! I'd also like to say a special hello to any Americans who have just got their own adaption of "The Attack of The Killer Puzzles". Good luck with it - hopefully the others will be available to you soon. OUTLINE: Each puzzle gives you the start of a joke - and if you solve it you find the punchline elsewhere in the book. Once you have solved every puzzle correctly, you get the information you need to decode the deadliest joke in the universe. HELP: Ooops!....If you have an early printing of this book (the cover does NOT have the "Killer Puzzles" logo on it and on the inside title page under "All rights reserved" the numbers go right from 10 - 1) then there were one or two mistakes. On page 52, the clock is not drawn correctly - so I'll tell you the answer should be 9.55. Page 44 you have to add up the odd numbers and take them away from the evens! CODE: In case you're really stuck, the pages with the fake punchlines are 11,25,56,73. OUTLINE: You start at the gates of Ghastly Castle. As you solve the puzzles you are taken through the different rooms of the castle including the secret lake, the catacombs and the laboratory. As you go along you have to build up a map of the entire castle and eventually you will find there is one room that you cannot get to. This is the room that contains the Phantom! You won't be able to see it by flicking through the book, but when you have solved all the puzzles AND discovered the haunted room, you will find how you can actually see the phantom right there on the page! HELP: Ooops!....Again the early prints were not perfect. If your copy does not have the "KILLER PUZZLES" logo on it, then the text on page 8 is misleading, obviously the gates are NOT portcullises, but don't let that worry you. The big secret of this book is to look at page 87 and find how to decipher Goblin code. There are lots of hints using the code dotted around the castle. Two more points...you CAN get to the Grey Bedroom through the hole in the belfry wall, and in the catacombs (Pages 40-41) you should NOT be able to reach the pass key or the upper right doorway from any of the other entrances. Sadly in some copies the printing going over the centre of the page does not make the maze as clear as it could be. OUTLINE: Solve the puzzles and work your way around the book - but if you go wrong you are instructed to punish yourself. Of course you're hardly likely to do things such as tipping cornflakes into your pants if no-one is watching you are you? However... once you've solved every puzzle the book tells you how to sabotage it so that nobody else can complete it! You then pass it over to your worst enemies and make sure that THEY DO suffer all the forfeits! HINTS: All right, this book IS tough and if it wasn't for the razor brained Tracey at the publisher's, I doubt I'd have been allowed to get away with it! Here are one or two answers to particularily nasty puzzles - there are 56 fish in the frog/lily pond on page 75 - there are 66 circles on page 81 - the cheapest clown outfit on page 63 costs £32. Also- notice which way the stripes go on the bases of the Pongy Pyramids! SOLUTION: I've had the most fantastic range of messages from all around the world about this book - frantic, rude, begging, weeping, bribing, furious, indignant - and so I've decided to put people out of their misery. (Do please still keep contacting me though!) Here is the order in which the pages should be visited. You'll still have to work out the message yourself! 50 48 113 26 84 24 70 58 38 20 50 64 31 92 40 44 and finally 14. Please note that there are some pages you DON'T visit - so in particular, don't bother asking how you're supposed to get an answer from page 86! OUTLINE: Originally this idea was a spoof t.v. format whereby a really obnoxious host presents the most humiliating games for SMUG TV. Sadly this sort of thing has become too close to the truth to be on telly, and so I made it into a book instead. If you get the puzzles right you'll avoid the maggot spray and the turgid bathwater and finally discover the mystery star prize... oooh whatever could it be? This book especially leaps to life thanks to some fabulously funny pictures by the artist Chris Fisher. HELP: Only one hint has been requested so far, so here it is: Page 87 - start on the "R" just below the crow and move round 9 places to the "U" continue from there! Can you get from the drain to the dustbin? If you think it's easy try again, but this time you can only pass EIGHT letters! 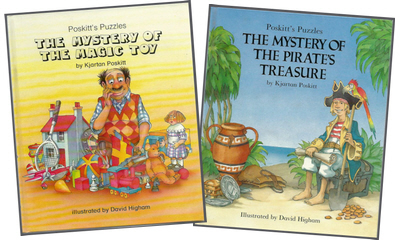 THE MYSTERY OF THE MAGIC TOY: The page sequence you should follow is: 6-16-14-8-17-20-23-12/13-7-22-15-19-10-24. Any other pages are traps. THE MYSTERY OF THE PIRATE'S TREASURE: Here's how to start going about it -1/ find what the pearls were in, then what the silver plates were in and then what the gold was in. 2/ work out what was in the pond. This should make the whole thing unravel for you!